Plant taxonomy classifies spotted dead nettles as Lamium maculatum. 'Purple Dragon' is a cultivar with purplish flowers and with silver in its foliage. One of the many other silver-leaved types is named 'White Nancy.' For a different look, try 'Cannon's Gold,' which sports chartreuse foliage (with pink flowers). These plants are perennials used as ground covers. In warm regions and/or in sheltered areas of your yard, they may be evergreen. Elsewhere (and depending on growing conditions), they may be semi-evergreen or herbaceous. Lamium maculatum stays relatively short, with the typical cultivar standing less than a foot tall. But its attractive variegated foliage spreads out to three times its height. This is true of 'White Nancy,' for example, which has white flowers. Other cultivars offer blooms with different colors. The plants bloom in late spring or early summer. Spotted dead nettles (or "deadnettles") are generally grown for their silver leaves, however, not their flowers. They are deer-resistant plants and can be slightly invasive, depending on where you live (check with your local county extension for any warnings that they may issue for your own region). In fact, they will naturalize in some areas. Being creepers and having a tendency to spread by rooting at the nodes, these classic cottage-garden plants are popular flowering ground covers. They are especially valued for use in shady spots, which is a condition that many plants dislike. They thrive even in shady areas that have dry soil and/or where deer control is an issue. The silvery foliage of these shade plants makes them a good fit for landscape designs with creative color schemes. Grow spotted dead nettles in full to partial shade and in acidic, well-drained, loamy soil. They can be grown in planting zones 4 to 8. Spotted dead nettles will not require much water when grown in full shade, a fact that (along with their resistance to deer pests) recommends them to homeowners seeking low-maintenance landscaping. In fact, they are one of the best perennials for shade. This ground cover requires very little care at all if planted in full shade. Do note, however, that the more sunshine that you give these plants, the more water they will need, since they perform best in an evenly moist soil. Also, some leaves may revert back to an all-green color (instead of being variegated); be sure to prune these out, so that the green color does not eventually take over the plant. Spotted dead nettle is native to the Old World. 'Orchid Frost' is known for its disease-resistance. It has pink-purple flowers, and its two-toned leaves are silver in the center and green at the edge. 'Anne Greenway' has green, chartreuse, and silver on its leaves, while bearing mauve-colored flowers. 'Aureum' offers a different bicolored look. Its leaves are golden on the edge and white in the center. It bears pink blooms. 'Ghost' is somewhat taller (up to 14 inches) than the typical L. maculatum. Even the individual leaves are bigger than on most kinds of spotted dead nettle. The leaves are almost wholly silver, and it bears light-purple flowers. You will also hear talk of "stinging nettles." While dead nettle plants are flowering perennials, stinging nettles, by contrast, are noxious weeds (but edible when properly prepared). 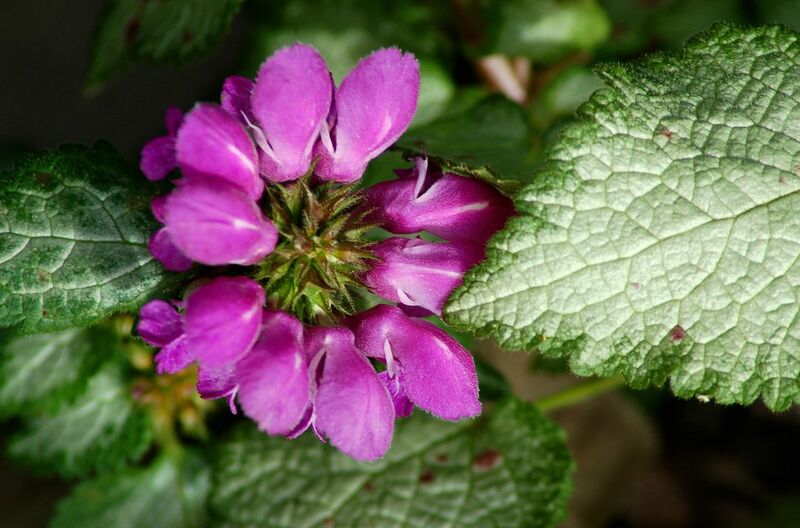 According to Monrovia Nursery, the unusual common name, "dead nettle" alludes to the fact that, while it resembles stinging nettles, "the stingers are dead" on L. maculatum, rendering it harmless. Are Any of These 12 Poisonous Plants in Your Backyard? What Are the Best Flowering Shade Plants? Yellow Dock: Medicinal Plant or Weed? What Does 'Variegated Foliage' Mean?